Walk For Health enables walkers of all different levels to enjoy the benefits of walking. In the Hutt Valley we are blessed with some of the best walking areas in New Zealand with the beautiful river trail. Our Sunday walks start at 9am - we walk twice a month from the Mitre 10 Mega Centre in Petone, on the other Sundays each month we have a Cafe Walk where we meet at various cafes around the area, perhaps Upper Hutt, Wellington, or up the Coast. The club have a small band of keen walkers who also compete in various marathons and half-marathons around the country. We now have a very successful Tuesday morning walking group starting at 10am from various locations - for these Tuesday walks you can talk to Karen (566 8689) or Lyne (970 5133), as they always start from a cafe somewhere. Some walkers do meet to walk on Saturday mornings and they meet at the Mitre 10 Mega carpark in Petone at 8.30am. If you would like to join them on a Saturday please ring Joan on 022 5697188, for walks on the hills, and Ria 021 0485955 for details of walk in the valley floor. There is an Application Form to join the club below, and you are invited to come along for a couple of walks first before you join. 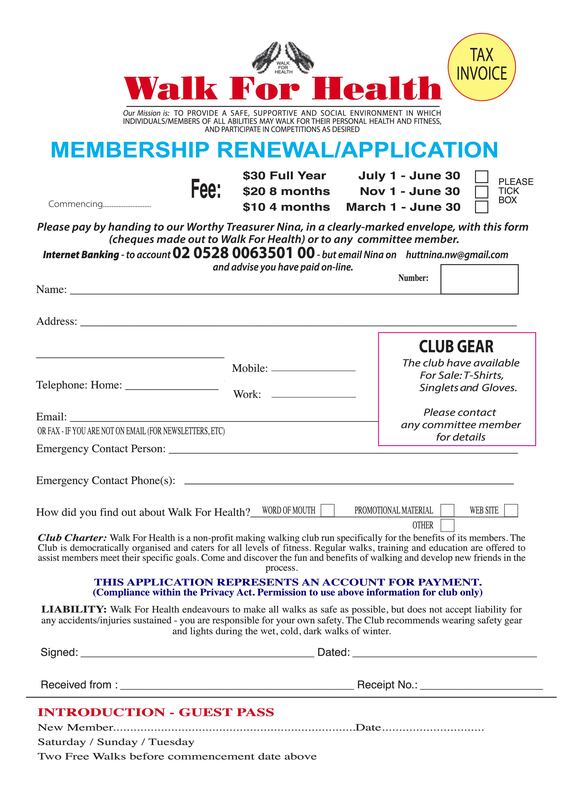 Do not forget to read the text under the Membership Form. So come and join us we are a really friendly bunch -do not be put off by the rather serious looking walkers in the graphic. If you require information on where the current walks start from please email Dave on walk4healthhutt@gmail.com or send a text message with your email address to 021 1168864 and you will be sent a current pdf.